Call Petals N Buds Florist... The place where flowers are uniquely designed and affordably priced. 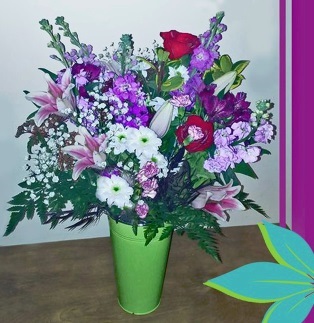 We're a local Brentwood Bay, British Columbia florist with a lovely variety of fresh flowers and creative gift ideas to suit any style or budget. It is our pleasure to assist you with any local, as well as worldwide deliveries and remember that corporate accounts are always welcome. For your convenience, we offer daily floral delivery to local funeral homes and hospitals. Tara Koshman has been involved in artistic endeavours from a young age. Her growing passion lead her to the expressive genre of floral arranging. Mentored along side AIFD seasoned florists Tara, full of fresh ideas, blends her own unique style with cutting edge European methods, resulting in progressive and refreshing floral designs. In the world of flowers, she has successfully started, run and sold two burgeoning floral companies: 1993 in Cranbrook, BC, 1995 in Lethbridge, AB and most recently 2010 in Victoria, BC. Tara's professionalism and ability to work with current color trends and methods is what propelled her into being a sought-after floral artist. We hope you enjoy your online shopping experience with secure 24-hour ordering right at your fingertips. If preferred, you may call us to place orders direct at 778-351-2772. Wedding Flowers & Flowers for Special Events ~ Our talented designers create bouquets, flower arrangements and on-site decorating with each client's individual style and budget in mind. Call us at 778-351-2772 to schedule a consultation. We would love to help you start planning flowers for your dream wedding or any special event – large or small. Thank you for visiting our website with flowers delivered fresh from your local BC flower shop, Petals N Buds Florist.